There were some fantastic scores in round 1, some rookies went well, some didn’t. But we also had some popular players go down. On top of that we won’t know final squads before lockout! That sounds like a reason to start scrambling!! Round one is in the books and we have seen some scores that we aren’t used to seeing until much later in the season. For a change we had a lot of Premo’s and also quite a few rookies scoring really well. Don’t get used to it! We know that this game will come back and bite you in the rear just as soon as you think that you have it sorted. Today we will talk captains, rookies and trades. I have seen plenty of discussion about these things online and based on that I thought I would deal with a lot of these things. Plenty of issues this week to deal with and plenty of advice for you too. So as they say… Keep Calm and Scramble!! So last week we had a few scores on the Thursday night that were worth taking, but really Dusty was the main one that people would have put the VC on. This week we have a few more options. Some of the guys that we should consider using are Dusty, Gibbs, M Crouch, Sloane or Laird. If you aren’t sure how to use the Loophole have a look at Calvin’s post or check back to last week’s scramble where we talk about how to do it. I think the key is the line. If you do take one of those guys you probably want them to be scoring over 130 if you have Tom Mitchell to use as Captain or 120 if you have to use someone else. Anyway, as always, if you don’t know how to use it or you don’t have any non-playing players on the bench, don’t do it. One of the hardest things to do, particularly during round 1, is picking which rookies to play on the field. If you didn’t get it right last week, don’t stress, you weren’t the only one. Also, just because they had a great game last week it doesn’t mean that they will go that big again. They are a week to week proposition. The main thing you want to see is them outscoring their break evens, if they are doing that then they are doing what you got them in for. If you get the right one on the field then I see that as a bonus. As for which rookies you need to have, make sure you go back to Wednesday morning’s article by the Milkmen where they have analysed the rookies that played and those to keep an eye on. If you missed one or two of them the strategy is different based on the format of the game you are playing. If you are playing RDT or SC I would say don’t trade for rookie errors. Their prices won’t change until after their third game so you have one more week to gather data on them before you have to do anything. However, if you are an AFL Fantasy player, we know that the prices have changed already. In this case, if you don’t have any other issues to deal with you should be making sure that you have the rookies that are playing and are generally doing well. As I said earlier, some of the rookies can be inconsistent so don’t get upset if it doesn’t work. Should you be trading this week and if so who? If you don’t have any LTI’s to deal with like Ryder or Libba then no, don’t trade. Trades in these formats are too valuable. The time to fix up rookies will be next week before prices start changing. Hell yeah, you have two a week, use them or lose them so go for it. Before you go tinkering with any rookie selections you should be dealing with any LTI’s first. So if you do have Paddy Ryder he is a must trade in all formats, he will be out for at least 4 weeks but I suspect it will be longer. So now that we know Nic Nat is up and running I would be tempted to go straight to him and bank some cash. Similarly Libba is also a must trade in all formats of the game. Given he is a midfielder, you have a heap of options, far too many for me to consider here. But you may want to go down to a performing rookie you missed to make some cash or a mid-pricer that fired for us. For someone like Zac Merrett or Matthew Kreuzer who we don’t know yet if they are playing or not I would be holding if it is only going to be one week for SC and RDT. However, in AF you can afford to trade them out if they aren’t on the team sheets tonight. If you are thinking about trading out someone like Nat Fyfe or Michael Hibberd, I wouldn’t be tempted to trade them just yet. It is one bad game. Everyone has one bad game during the season, this could be their only one this year. You would kick yourself if you trade them out and then they go big next week. As always, it is up to you, but I try not to trade premiums out just yet. Rocky, as fantasy royalty, deserves his own paragraph. I will put it out there, I am not an owner, but if I did own him I would hold him for now as we know he didn’t have a pre-season and it was his first game in a new team. Cut him some slack. He is more than capable to come back and score big next week. Having said all of that, if you have no other issues in your AF team then you can be forgiven for trading him. As we stand right now we won’t know the teams and squads for the rest of the round until later tonight, just before the game gets underway. That is fine and all normal. However, the issue we have is that final squads for Sunday’s games won’t be announced until about 5pm on Friday night. Also, we won’t know final squads for Monday’s game (hence Danger’s status) until late on Saturday night. Now. Why is this all important? 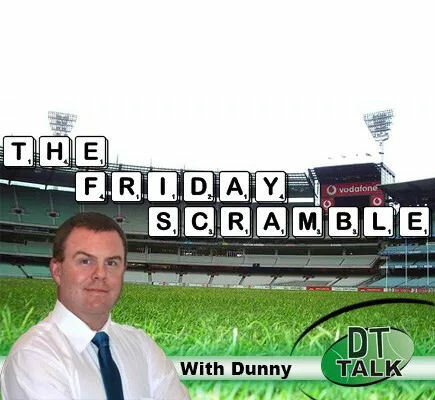 Well in AF and RDT full lockout will occur at the start of the Good Friday game which begins at 4:20pm EDT. Hence we won’t know the final status of the rookies and injured players (like Danger) before Lockout occurs. It is just round 1. Don’t panic. There are plenty more rounds to come. Rookies will frustrate you, don’t stress about getting the wrong one on the ground, as long as they are in your team you are winning. That’ll do us this week, the main thing is, don’t panic trade after just the one game. Anything can happen. Not only can the guy you are trading out go well, the one that you trade in might have had one out of the box! Sorry. Forgot what time it is over east. Jacob’s to Nicnat a stupid idea ? I know it’s only round 1 so probably a little harsh on sauce ??? I’m waiting until next round- see how they both go this weekend. Not with 53 percent game time. what to do with Florent? Reckon hes out the team this week after last weeks performance? 45k in the bank. Not sure what to fix up, maybe Merrett and Brayshaw to Coniglio and Barry? Why not O’connor to O’shea? Chase the BE. Most definitely Guthrie. Love tonight’s teams on AFL.com. Apparently the Lions and Demons have agreed to play 16 a side. The Lions have brought in one but left out 3. The Demons have brought in no-one but omitted 2. The Bulldogs have brought in 3 and left out 3 but still manage to have an extended bench. The Weagles have brought in one, both of whom is playing his first game. The Weagles also have an extended bench. The numbers don’t add up for the Power, Cats and Hawks. Well done afl.com – keep ’em guessing! What trades do I make to my team? So far I have done O’Connor to Cam O’shea with 1k left but struggling to find another trade. I’d go Bont > Cogs, Naughton > Guthrie. Why’s everyone getting on the Guthrie bandwagon? I really don’t want to get rid of Zerret the only reason why I want to consider him traded is due to his BE, If I get Cog’s for example he will continue to generate some cash, when Zerret starts firing again ill jump back on him. Here are my options at the moment from Low risk to high risk. Trelly > Omera, Rayner > Taranto. thoughts on naughton to o’shea and 170k ruck to english? I notice so many coaches really hamstrung by having so few $$ in the kitty! I’ve always thought it was a mistake to start the season cutting it so fine, with no room to move. FWIW my dt/fantasy mentor taught me some golden rules that apply here: First, Guns’n’Rooks! Second, get the players you want, not the best you can afford. Third, get your premos when they’re underpriced (in one way or another). Leaving yourself with anything less than $50k in the bank early in the season leaves you shuffling deckchairs on the Titanic! So true, kept a kitty to upgrade to Danger but considering all mid premos went 100+ I’ll sit on it another week. O’Connor and Brayshaw to O’Shea and Kelly? Only alternatives would be to take one of Hibberd or Fyfe out but happy to give them one more week. I’m doing your first picks. Always fix rookies first and O’Connor is a must. Brayshaw could come good but Kelly to hard to pass. Only if you really need the cash. Otherwise hold Rayner and give him a chance to do his thing and make you some $$. There’s probably other issues you can address? In Fantasy our trades are precious – don’t waste them! Callum mills a safe option? Only Crows and Tigers locked tonight yeah? can do trades tommorrow? Yep, but remember that full lockout tomorrow is earlier than usual! I have him in RDT I’m pissed. I dont have him in RDT so hopefully this helps me catch you. All you fellas on the crouch train, my dearest condolences are with you on this night of terror. BUT SUCKED IN YOU BUNCH OF PANSY FLOGS! Bro im gunna fukc everyone next week & put the VC on Titch. Good grief! Don’t waste trades offloading a (selected) player who you plan on getting back in! That’s two trades wasted on someone you could’ve just held onto. Oops sorry, you have Crouch! Um, I think my point stands?! Keep o’connor with doedee emg or trade rayner/naughton to guthrie/oshea (through sic if rayner) or gowers? worst case scenario o’connor doesn’t play and i get doedee’s score but I keep someone not making cash. Or o’connor does play and I save a trade with him on field. houghts on naughton to o’shea and 170k ruck to english?